Over four years later, this exciting concept continues with the Outlaw 1845 and Bandit 1895 amplifiers. Featuring a Wild West theme, each chassis and heatsink is constructed of brushed aluminum and finished in a gunmetal blue anodizing. In keeping with the 1840's period, the terminals, screws and the Outlaw Head logo are finished with a bright polished nickel plating. The amplifier ships in a unique wooden crate and is wrapped in a custom silkscreened replica U.S. Mint "Booty" Bag. The Outlaw 1845 is a 4-3-2 channel amp with built-in crossovers and LPL low pass level circuitry. Based on the M100 and M50 under the same heatsink. 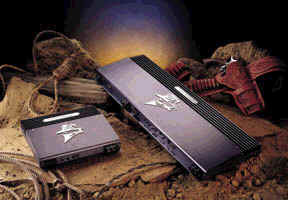 The Bandit 1895 is a limited edition two channel amplifier built in the same style as the Outlaw 1845 amp. The Bandit is based on the M50 and boasts 2 x 50 watts RMS rated power at 4 ohms. The Bandit features Tri-LinearTM output capability, bridgeable outputs, stable operation into 1 ohm stereo loads, adjustable Bass EQ (0 to +12dB) at 45Hz and a 24kt Gold plated G10 double sided, 2 ounce glass-epoxy circuit board. A classic commemorating the spirit of America's Dream Highway and Audiophile's Dream Amplifier. The Route 66 is a six-channel amp based on a M25 and M44 under the same heatsink with a white powder coated finish. The section labeled rear is the M25, while the subwoofer and front section are the M44.